O’Bannon Presidential Unit Citation presentation, New Guinea, viewed from Nicholas with Radford at left. Laid down the same day at Bath, Maine, built side-by-side over the next year, in action together throughout World War II, selected to enter Tokyo Bay together at the end of the war, recommissioned together for the Korean War, and finally decommissioned together in 1970, Nicholas and O’Bannon were twins. The first two Fletchers launched and commissioned, they plus Fletcher were the only ships of the class to arrive in the Pacific in September–October 1942 during the Guadalcanal Campaign. 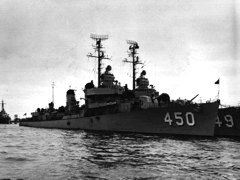 On 12 November, these three ships were escorting a nearby convoy when Adm. Daniel Callaghan saw the need to add destroyers to his task force; while Nicholas stayed with the convoy, O’Bannon and Fletcher featured in the Friday-the-Thirteenth naval Battle of Guadalcanal. Nicholas and O’Bannon continued to serve together in the Solomon Islands, both participating in frequent actions up the “Slot” including the Battles of Kula Gulf and Kolombangara, 5–6 and 12–13 July 1943 and the action off Horaniu, Vella Lavella, 18 August. Nicholas was alongside De Haven when the latter was lost to air attack in February, and in line ahead of Strong when that ship was torpedoed in July. O’Bannon engaged shore batteries while Chevalier rescued Strong survivors in July, then rammed the torpedoed Chevalier and picked up her survivors during the Battle of Vella Lavella in October. Nicholas was chosen as flagship of their squadron and, with Radford, earned a Presidential Unit Citation for her action following the Battle of Kula Gulf. 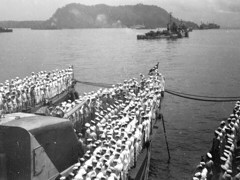 O’Bannon earned a Presidential Unit Citation for her overall action in the Solomons, presented with Nicholas and Radford in attendance (see photo above). Both were lucky to dodge enemy bombs and gunfire and to be missed by torpedoes that could easily have hit. Both sank enemy submarines; both were awarded Philippines Presidential Unit Citations. Throughout, their crews enjoyed the respect and esteem of one another and of the entire Navy—O’Bannon received a particular tribute by Adm. Halsey and was understood by many to be his favorite destroyer; the Nicholas received similar tributes by DesPac and Adm. Nimitz. Mothballed and then recommission ed together nine years to the day after Nicholas was launched, they continued to serve with distinction, even escorting nuclear carrier Enterprise together off Vietnam in the late sixties. Finally, on 30 January 1970, they were decommissioned in the same ceremony, and sold for scrap. Both their names were taken by ships in today’s navy, and even by starships in science fiction.